When Julie completed her degree in Economics at Queens, she realized it was time to get back into nature. She worked as a canoe trip leader before university, and wanted to take her river skills to the next level. She enrolled in a 3-month whitewater guide training program. 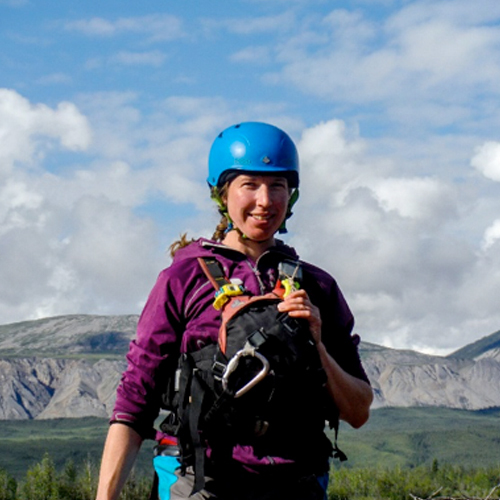 After rafting and kayaking on rivers in Canada, the U.S. and Mexico, she hasn’t looked back. Apart from guiding with Boreal River, Julie has worked with Esprit as a raft guide on the Ottawa River. She was also an expedition guide with youth at risk and leadership development programs for Outward Bound. Julie has also guided and paddled in Nepal and Patagonia. Julie led several programs with Boreal as a guide and then transitioned into instructing whitewater rescue as well. If you’ve been on an expedition with Julie, you have been amazed by her campsite ‘systems’. By the time you have changed into dry clothes, Julie has the kitchen set-up, appetizers ready, tomorrow’s bread and tonight’s dessert baking in the dutch ovens, and a cooking station ready for you to jump in and start chopping something. It is ridiculous and she is definitely a guru. Whether Julie’s at the helm of a heavily-loaded canoe on a 20-day expedition, or a raft with 6 first-time paddlers, her river running is always smooth. If you’re in her boat, she’ll be happy if you paddle but she probably doesn’t need you to as she works in unison with the river. We are lucky to squeeze in a few weeks of river time with Julie every season as she is pursuing her next challenge. She recently completed an undergraduate degree in nursing. She started work in Northern Ontario as an RN, and is applying to medical schools.